16 Miles of String - Andrew Russeth: Welcome! Thanks for stopping by Sixteen Miles of String. 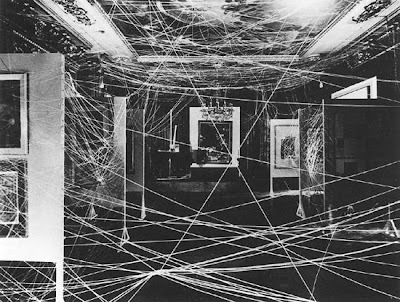 The name comes from Marcel Duchamp's 1942 Sixteen Miles of String installation for the First Papers of Surrealism exhibition in New York City at the Whitelaw Reid mansion. When he first set up the string, he was forced to string some from the chandeliers to get the effect he wanted and almost burned down the house. Said Duchamp: "I was just standing there when the black spots appeared and in another second glowed and burst into flame." Quality of the content is the main element of the blog and this is the way of writing and presenting. Waiting for again wonderful blogs or posts. Follow this link for godaddy low-cost hosting 99 godaddy . Thank you very much because you are willing to share very useful information to many people.